Dorothy Michaels is the biggest sensation to hit Broadway in years. She’s talented, outspoken, and an inspiration to everyone around her. In fact, she’s too good to be true. Because squeezed into Dorothy’s sensible pumps is actually Michael Dorsey, an out-of-work actor willing to do anything for a job — even if it means playing way against type. Now, as audiences fall for Dorothy and Michael starts to fall for the woman of his dreams, he's learning that the hardest part of show business isn’t getting to the top... it’s keeping up the act. 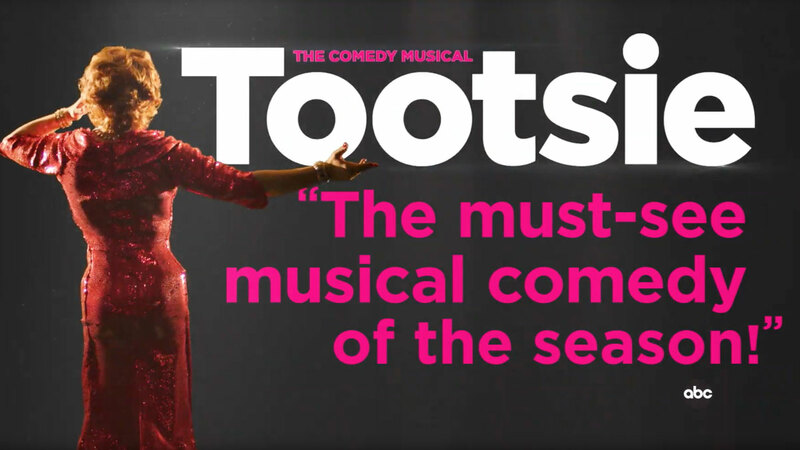 Starring Tony® nominee Santino Fontana, TOOTSIE is “the must-see musical comedy of the season!” (ABC-TV). Don’t miss this “outrageously funny” (Time Out) new production featuring a score by Tony winner David Yazbek (The Band’s Visit, The Full Monty, Dirty Rotten Scoundrels), a book by Robert Horn, choreography by Tony nominee Denis Jones, and direction by eight-time Tony nominee and Olivier Award winner Scott Ellis.